For almost a century, the Romanov reign has captivated the imagination. Through the eyes of Darya, Imperial Russia-with its enchanting ballets, avante-garde artwork, sumptuous banquets, and ornate jewels- bursts into life, rich and glorious. The royal family embraces Darya, pulling her close until her heart and soul are inextricably bound to the fate of the last Romanov. Her years spent in the grandeur of the Imperial Family haunt Darya. Even now, as a wise beauty with an energy younger than her many years, she believes she is responsible for those murderous events that changed everything. If she can find the heir to the Russian throne, if she can bring back the innocent royal whose appearance would shift the foundation of her country, she might also be able to piece together the broken parts of her own life. 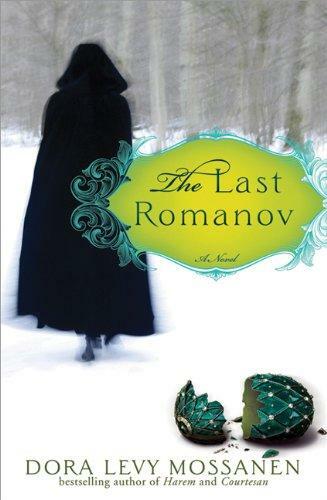 An unforgettable woman’s redemptive journey to understand the mysteries of her past and the prophecies of Rasputin, The Last Romanov is an enthralling tale of Imperial Russia, second chances, and royal blood. Born in Israel and raised in Iran, Dora Levy Mossanen fled to the United States at the onset of the Islamic Revolution. She is the recipient of the San Diego Editor’s Choice award and the author of Harem and the international bestseller Courtesan, which have both been translated into numerous languages. She is a regular contributor to the Huffington Post and a graduate of the USC masters of professional writing program. She lives in Beverly Hills, California.